Methods: This was a cross-sectional study conducted at a programmatic management unit of drug resistant tuberculosis, Lady Reading Hospital Peshawar, Pakistan. Two hundred and forty-three newly diagnosed multidrug resistant tuberculosis patients consecutively enrolled for treatment at study site from January 1, 2012 to July 28, 2013 were included in the study. A standardized data collection form was used to collect patients’ socio-demographic, microbiological, and clinical data. SPSS 16 was used for data analysis. Results: High degree of drug resistance (median 5 drugs, range 2–8) was observed. High proportion of patients was resistant to all five first-line anti-tuberculosis drugs (62.6%), and more than half were resistant to second line drugs (55.1%). The majority of the patients were ofloxacin resistant (52.7%). Upon multivariate analysis previous tuberculosis treatment at private (OR = 1.953, p = 0.034) and public private mix (OR = 2.824, p = 0.046) sectors were predictors of ofloxacin resistance. 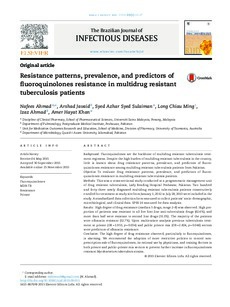 Conclusion: The high degree of drug resistance observed, particularly to fluoroquinolones, is alarming. We recommend the adoption of more restrictive policies to control nonprescription sale of fluoroquinolones, its rational use by physicians, and training doctors in both private and public–private mix sectors to prevent further increase in fluoroquinolones resistant Mycobacterium tuberculosis strains.